In Interference/Confluence, Carrie Ann Plank employs new technology to create large-scale printing matrices while revisiting anachronistic classical printing techniques. Plank's work explores the reinterpretation and reorganization of visual information systems, how context shifts meaning, and how information is translated through the mash-up of old and new technologies. Plank is interested in the confluence of the hand and digital mark and includes abstracted halftone variations (unique to the world of printmaking) in much of the pieces as a nod to the unique process of the residency. Windy Chien makes art that activates space and crafts objects that elevate the daily rituals of life. She is best known for her 2016 work, The Year of Knots, in which she learned a new knot every day for a year. Her work ranges in size from a knot that can fit in the palm of a child's hand to majestic, room-sized installations. Following long careers at Apple and in the music industry, she launched her studio in 2015. Chien’s book about her creative pursuits and the Year of Knots will be published by Abrams in 2019. In Mutations, Chien explores the potential of splices, among the most animal, fertile knots. To the artist, they are palpably alive, as if the ropes are biomorphic organisms dividing and growing, consuming themselves and others. Exploring the capabilities of the CNC router at Local Language, the exhibition also features a series of “spinal column” mobiles, themselves corporeal creatures given life via a single knot and an unbroken 200-foot line. 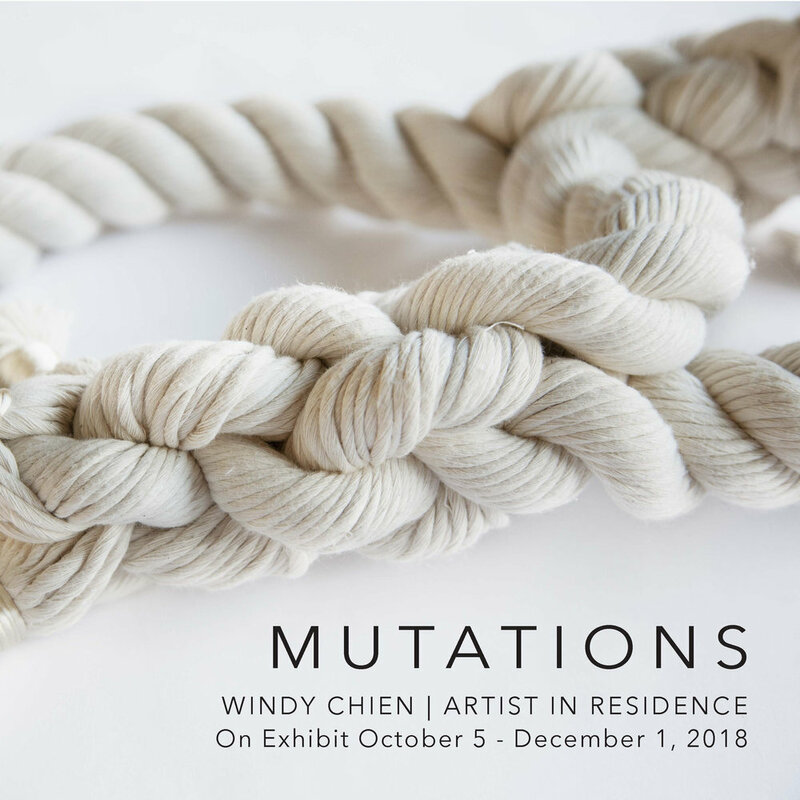 Accompanying the exhibition is the debut of the Year of Knots fine art print, showcasing Chien’s breakthrough work of 2016, where she learned and made one new knot each day of the year. I’m a Chinese-American woman who grew up a US Army “brat” and lived all over the country, including a decade in Hawaii. Due to my ethnicity, love of fringe culture such as punk rock, and uncommonly audacious attitude towards life, I’ve always felt like an outsider. Indeed, I’ve embraced outsider status as a means to self-define, rather than let the world tell me who to be. Yulia Pinkusevich is an interdisciplinary visual artist born in Kharkov, Ukraine. Relocating to the US from the USSR at the age of nine, her world view has been rooted in change. She creates large-scale environments that deal with urban and social systems, addressing the psychology of space and perceptions of our fragmented environment. Formally, the work is engaged with the direct experience of the viewer through perspectival illusion that plays with the subconscious and cognitive understanding of space. At times Pinkusevich creates spontaneously allowing the process to inform her, while at other times she embarks on deep research and iterative design prior to creating the work. While an Artist in Residence at Local Language she explored ways of working with aluminum; printing, etching, cutting, and folding. The exhibition features a new series of drawings and prints based on Cold War military maps that study the impact of nuclear bomb airbursts and display fatal and non-fatal casualty isorithms* over particular types of cities. Pinkusevich was struck by the immense tension between the elegant geometries of the maps and the chaos and mass destruction they represent. The works attempt to reconcile the rationalization of nuclear war in a formula by adding an empathetic variable. Lauren Napolitano is a traveling mixed-media artist who creates anything out of everything. Her work celebrates the handmade and the imperfections that come along with it. She is influenced by her mother’s Mexican heritage and leans heavily on her ancestors as she creates and gathers inspiration. Napolitano uses symmetry as a starting point. Any flaw is a celebration of the human hand. For Lines & Conversations, ReCheng draws inspiration from textile design and from the work of Richard Tuttle, Leonor Antunes, and Louise Bourgeois. During the one-month residency at Local Language, ReCheng explored the dynamic relationship of lines. She is interested in the visual relationship and aesthetic qualities of these lines that also speak to a state of being that’s in flux, untethered, and in conflict. The exhibition is divided into two parts. The first part, titled Weightless, is a series of four prints on linen. The lines overlap, squeeze together, and float in mid-air. The second part, titled Vestige, features a series of printed images on porcelain panels and linen scrolls. In Lines & Conversations, ReCheng is presenting her two-dimensional work publicly for the first time. 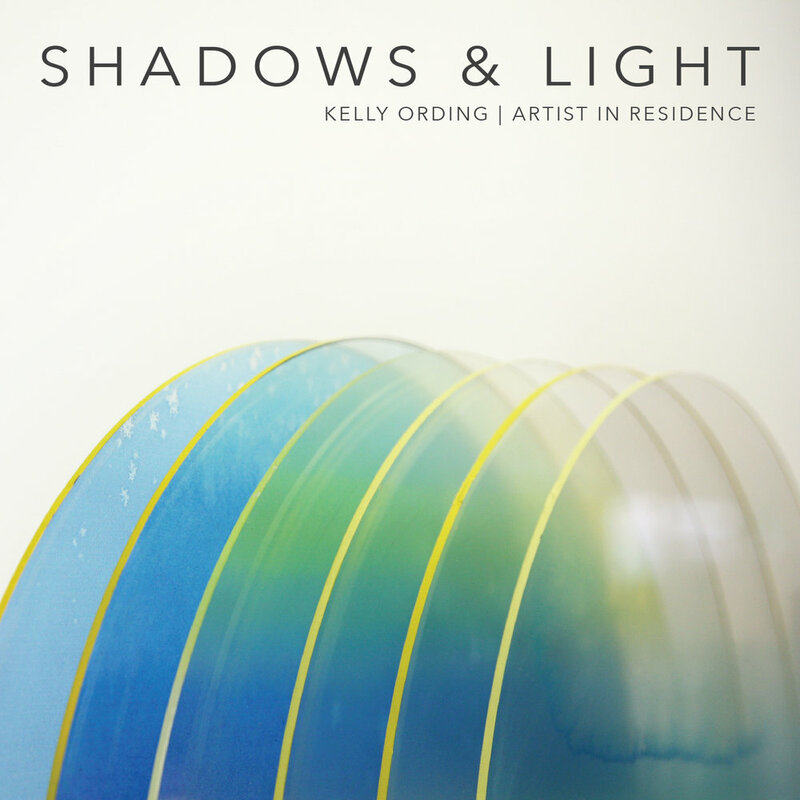 Drawing has always been an essential part of her studio practice and is in direct conversation with her wall installations and sculptural work in porcelain in this exhibition. Jeff Hantman is intrigued by the challenge of working with wood in an unconventional way by creating curved structures and assemblages with this rigid material. An alumni of the Rhode Island School of Design with a BFA in printmaking, Hantman is an avid scavenger and recycler; he is drawn to discarded items, from plywood with oil stains to metals covered in old paint. His studio is packed with weathered objects, plywood scraps, 2x4s, broken furniture and a variety of other found / used materials. Hantman combines woodworking, painting, drawing, printmaking, laser cutting, and CAD to create curved wall hangings and freestanding sculptures. 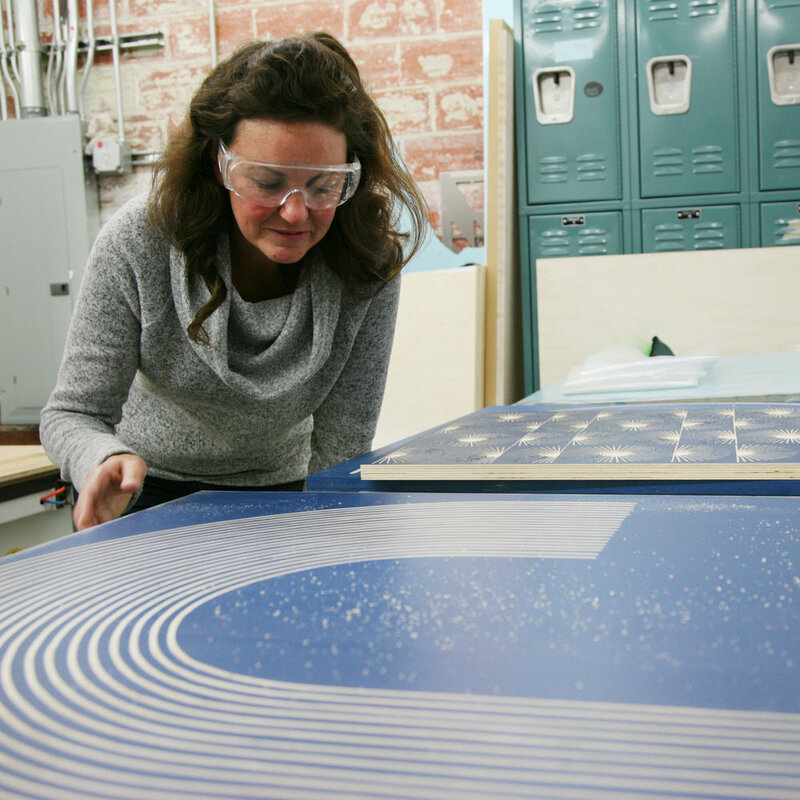 Hantman worked on a combination of digital tools during his residency at Local Language: the CNC to cut armatures and the UV flatbed to print imagery on found wood. Back in his studio Hantman reassembled the artworks, modifying and adjusting imagery to create new narratives and compositions. In this series of dimensional paintings made during her residency at Local Language, Wagner ponders questions of human cognitive and physical flexibility in regards to atmospheric, industrial, political, and emotional change. She remains darkly optimistic, continuing to scale her color scheme, materiality, and mark-making to meet the 1970 voyage of the Apollo 14 and the epic experiences and ethereal, transcendent conclusions of astronaut and noetic scientist, Edgar Mitchell. For this body of work created in Local Language's Artist in Residency program, the artist experimented with two new media: printed wall drawings and constructed wood pantings. These pieces create a deeper and wider field of vision, inviting the viewer to expand their understanding of context and their place within/without structure. At Local Language, HibmaCronan has continued his practice by creating a series of sculptures with intricate bone structures to honor the character and texture found from the metamorphosis of his "street legal sculpture," created from a 1963 Ford Falcon Deluxe Clubwagon. 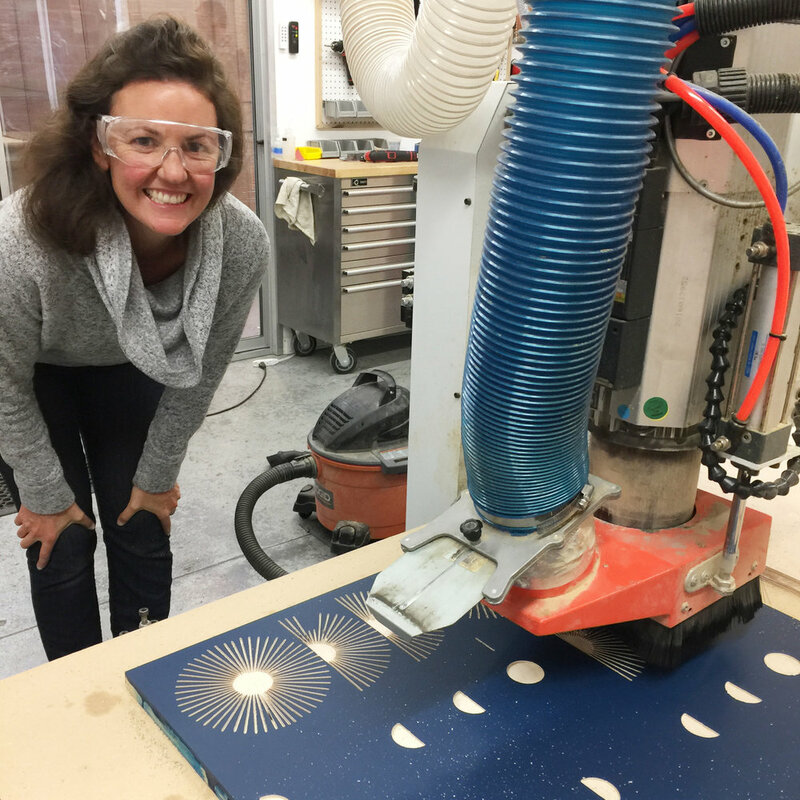 Koehle investigates properties of water, using paper, resin, 3D printing, CNC machining, and laser cutting. At Local Language, he is experimenting with imaging the simulated motion of water. By tracing the paths of individual water particles, he reveals the invisible patterns moving below the water's surface. Trueman’s work made in the Local Language residency is a combination of painting and pigment print on anodized aluminum. This unique interaction of print and paint on the reflective surface allows for a back-and-forth relationship of positive and negative, reversing the norm of gestural painting by presenting the gestural mark and its inversion within the same space. In her recent work, Frey has been exploring a juxtaposition of simplicity and complexity, inspired by the contrasts found in her environment. While her work is not representational, the process of creating a piece - and a series - could be a way of relating to a complex and chaotic world. Revising and perfecting lines brings an amount of order; their starkness on a textured canvas, a bit of clarity. Amorphous shapes emerge, resisting that order. Patterns appear, then disintegrate. Just as weeds grow in sidewalk cracks, the lines of a maze are only temporary boundaries. Garrido constructs her paintings and drawings by using a delicate balance of choice and process. In response to personal narrative and internal dialogue, to the push and pull of the compositions' internal gravity, and to the medium of the paint or drawing materials, she projects images and forms onto the surface. As the artist composes, shapes weave through the picture plane and the gestures she records can read alternatively as flat or as dimensional and sculptural. Garrido favors nature-based forms and rhythms and is drawn to shapes that tangle, overlap, sit, lean and lay. By weighing ambiguity with representation, Garrido works through the many stages of each piece, gradually arriving at a final composition. In Victoria Jang’s recent work produced at Local Language, she explores the ubiquitous family operated beauty supply stores, the proliferation of which became synonymous with Korean American businesses in Black communities. Merging traditional Korean ceramic techniques, Jang morphs abstract sculptural forms into complex tangles of nails. Along with the sculptural winding forms, Jang's humanized landforms tied conceptually to geography explore the interwoven and complex relationship of these two minority communities and businesses that dominated the phenomenon of the beauty supply industry. Jang’s work is a complex weave of expectations, and misconceptions of transitioning communities. Throughout his residency at Local Language, Cutlip expanded upon his signature abstract style by experimented with paper and printed collage making, using hang work along with print technology to create unique new layered artworks. Shimek and Local Language collaborated on this exhibition to transform woven works into printed art objects. By experimenting with color blocking and text, the woven pieces have experienced a metamorphosis from decor to artwork exploring social movement, vulnerability, and dissent. During the one-month residency, Tovera created a new series of work through experimentation and map imaging, incorporating printing and mark-making using minerals, water, solvent, and fire. The images and objects result from processes of accumulation evolving out of research using Google Earth satellite mapping and explorations inspired by geological formation and topography. The paintings and sculpture in this exhibition reflect the synthesis between natural and artificial processes, the relationship between the two, and how both forms, though dissimilar, may propel each other. Surface tension is the barrier-like force that exists on the surface of a substance, caused by asymmetries in the attraction between surface molecules. Offset molecules create a new tension and attraction at the edge of the material, activating its edge, and developing different properties.